You are here: Home / Alan Turing / Leonardo DiCaprio to Play Gay Enigma Codebreaker Alan Turing? Leonardo DiCaprio to Play Gay Enigma Codebreaker Alan Turing? During World War II, Alan Turing, who is known as the father of modern computing, devised the Turing Bombe, a codebreaking device that was used to decipher the Nazi enigma codes, up to 3,000 messages per day. He was also gay, and two years after being convicted of "gross indecency" and sentenced to undergo hormone therapy, he killed himself with a cyanide-laced apple. This British historical figure most prominent from 1940 through 1955 is also the subject of a big spec script sale today. First-time screenwriter Graham Moore’s The Imitation Game was snapped up by Warner Bros in a 7-figure deal. I’ve learned that the studio outbid half a dozen indie companies because Leonardo DiCaprio ”has the inside track” to play the lead and was chasing the project. But so far no talent is attached. I hear Ron Howard is interested in directing. 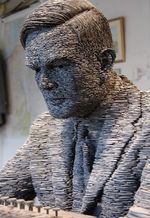 First-time producers Nora Grossman and Ido Ostrowsky owned the rights to Andrew Hodges’ definitive biography Alan Turing: The Enigma and worked with Moore for more than a year to get the script just right. On a side note, it's been reported that Steve Jobs named Apple after Turing, thus the logo with the bite out of it. However, that's not the case.